DLE The strange case of Dr Jekyll... - does anyone here have it? fading slipcover. So I received my copy a couple of weeks ago. The book itself looks amazing, however the slipcase did not look too good. The gilded frame around the picture was really faded, I did ask for a replacement and received it today....the same thing, the gilded frame around the picture is looking really faded. Is it the same for all 1200 books or am I very unlucky? I really don't know if I should ask for a second replacement, return it or just try to accept the fading. No other of all my DL's has this kind of fading to the gild on the slipcase. Both are copies below #300 if that would make any difference. I’d lean towards sending it back and keep trying but it would be interesting to see what others have to say. I don’t own this so I can’t give any other input. >2 GOBOGIE: Thank you! I was very disappointed when I received the replacement today, I was really looking forward to it. I wonder if I'm just being very unlucky. It’s hard to accept (what we view as) something that’s less than perfect when we pay so much for some of these limited editions. I sent back my first copies of the Cpt. Cook DLE’s because of imperfections to the gilded ends of the paper. I’ve read that others just accept it. To each their own but my personality type just wont accept it. If they were second hand $5 books at a used bookstore, then that’s different. But they’re not. I agree in what many say here in that if we don’t keep returning the subpar books, nothing will change. That is exactly my thought. When paying $375 for a completely new sealed book I want it to be perfect, no flaws, it's hard for me to overlook the fading, it's very eye catching -like worn out. I will call them on Monday, maybe they can take a look at a copy before shipping it to me to make sure the gild is not faded, there's even no need to take off the sealing to take a quick look, just a matter of service. They have been very helpful in the past, hopefully I'll be happily surprised! Take a pic so we can see how it looks, in case we order and receive the same thing. >6 Wootle: LOL not a tech.... I don't even know how to post a picture here ;D ...if you let me know how, I can post one later today or tomorrow. Here are the pictures as promised, placed one of my other DL's beside just to compare. What are your thoughts? That gold looks really bad though. The color of the slipcase itself is a bit lighter on Dr Jekyll, more of a greyish tone, and The hound has more of a bluish tone. I think they are meant to be like that. It's the gild that is a concern for me. You can't really even see the borders of the gilded lines, very faded.....and this is the second copy that I've received, same thing on the first one. One copy on ebay has some of the fading as well, but not as severe as yours. Hopefully you can get one in better condition. >1 Love2Read. : My slipcase has the exact same issue, it's very faded. I can upload a photo tomorrow morning if you want to compare. Instead of trying to exchange it I eventually ordered a second and third copy to see if I could get one without the issue, but they also looked the same. So I kept my original copy and returned the other two. My copy is definitely numbered under 300, but I'm not home to check the exact number. >17 NotDownInAnyMap: Oh interesting......I really don't think it's supposed to be like that, I can't imagine that anyway. Probably something going wrong in the first round of printing (if they do rounds, otherwise they will all have the same fading). I will call them anyway tomorrow and ask them to check the other slipcovers, I really would like to have one without the fading, it looks so worn out. >18 Love2Read. : Here is my copy for reference. The other two I received had worse fading (like yours), so I kept this one. Please let me know what customer service says when you contact them. If I can get a slipcase without fading, I would want to pursue that, especially if they say they haven't printed all 1,200 yet and do a second round of printing. EP should be able to remake the slipcases without breaking the bank. It’s not like the have to reprint the entire book. I’m sorry to see this happen. It is the only flaw I’ve heard of in the entire illustrator-signed series, and I own 10 of them (but not this one). >19 NotDownInAnyMap: Thank you for posting a picture of yours. Yours looks somewhat better than mine but still faded. I called them, they will look into it and call me back, Let you know! >20 jroger1: I have several of the titles in this serie as well, and this is the only one that has a flaw. 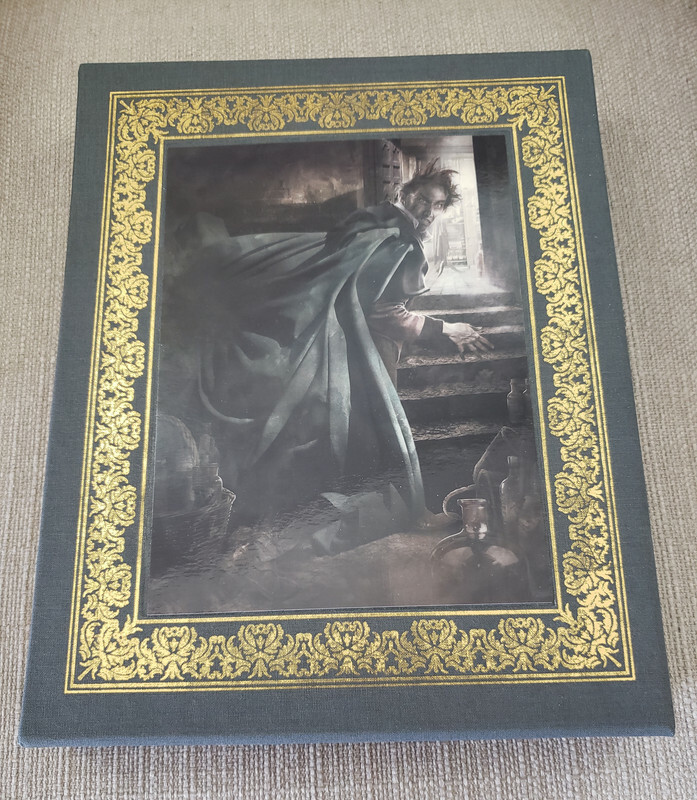 The book itself is beautiful, it's the slipcase that has the fading -and I agree, they should be able to remake the slipcases, considering the price one would like to receive a flawless set. Mine is #148 and the slipcase is "slightly" faded ... but not enough to where I even thought It was an issue. I thought it was "the look". The Hounds of Baskervilles is definitely a blue slipcase while Dr Jekyll is more of a grey. 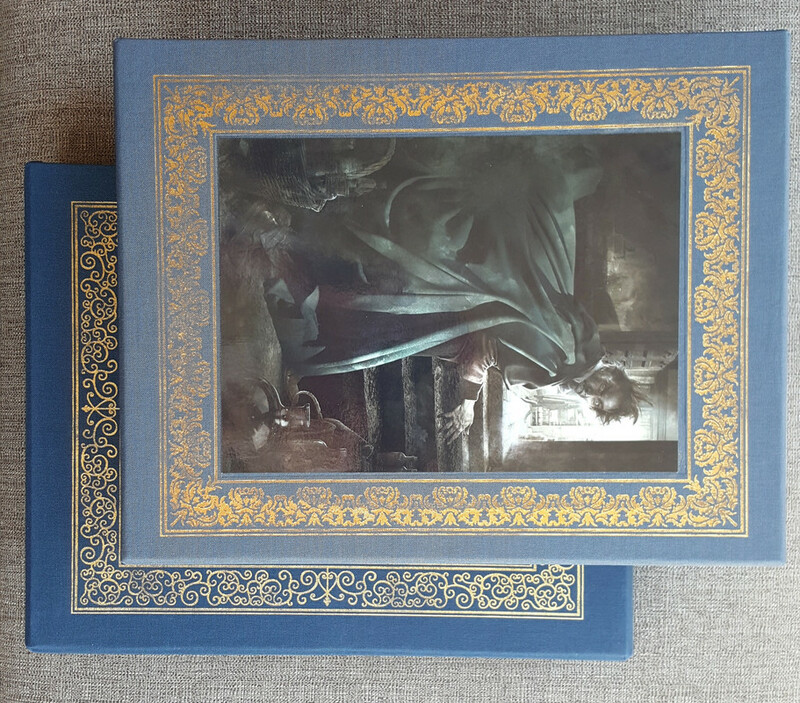 With the "murky/smoke" edges of the illustration on the slipcase and the grey/blue tone of the slipcase itself ... I thought the slight wearing of the gold was just a design choice. Again, mine has very subtle fading so I don't think of it as too much of an issue. It is funny no one seems to have printings with a number over 300 on this post? I've had to exchange several DLE's to Easton press recently. I'm with most of you ... spending this amount of money ... i would like as close to perfection as possible. I actually am about to ship back another copy of Dr Jekyll today ... because my first copy had rubbing on most edges of the actual book cover itself as well as a weird black spot on the cover (kinda like the reddish leather was rubbed off). But looking at that slipcase now ... it looks the same as the copy i'm keeping ... slightly faded ... but almost exactly in the same way. The one that I am returning is #234. Be curious to see if anyone with higher numbers are having a similar issue. With all these little issues popping up ... I finally went thru all my DLE's page by page to make sure there were no issues and I'm glad I did because I just went thru Hounds of Baskervilles and it is pristine except on page 193 it looks like someone spilled water across an entire paragraph and the text is just completely smudged. The smudging goes thru to the other side of the page too. So strange that whatever happened only affected this one page. All is good though ... Easton Press customer service has always been really good (for me at least). And they are shipping out a new copy as we speak. >23 thisGuy33: I always inspect my DLEs when I receive them and have gone through a good number of exchanges for imperfect copies, but I can't say I go through them page by page. Luckily my Hound of Baskervilles page 193 is good, but you've inspired me to go through all my DLEs page by page. I hope your replacement copy is perfect. The quality of Hound of Baskervilles is superb and the paper is the most luxurious than any other book I own. >23 thisGuy33: Had to check mine on p193....all good :) I don't check my DLEs page by page, usually just skim them through quickly, but always taking a closer look at cover, sides, gilded sides, and the very first pages. 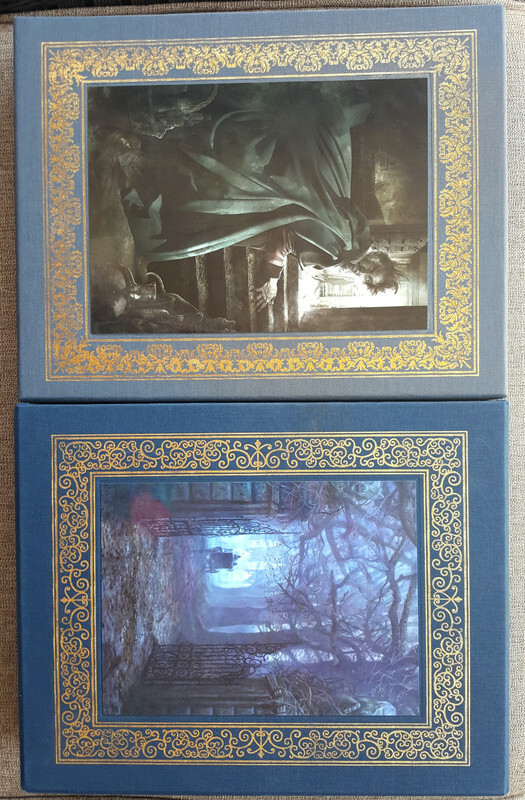 They have all been superb, just unlucky with the slipcase of my last one. I really don't think it's designed to look faded, would be a very odd design IMO. >24 NotDownInAnyMap: Yeah, I too always do an inspection but like you it's usually not a page by page. But I'm glad I did ... took me a while to get thru my 10 or 12 of them ... if I had not done a page by page i'm sure I would've been highly disappointing when I found something wrong in a year or so when I decided to read it. And I don't know how Easton Press is with returns after you've had the book for a long period of time. And I agree ... the paper of the "Hounds" is awesome. Has such a thick and wonderful feeling texture. I find myself running my hand across the opposite page while I'm reading it. That's why I feel sad for people who just read on kindle or ipads ... they miss such a wonderful and complete experience of holding a really finely produced book. I'll try and post a picture of the smudge in my "Hounds" book so people can see what I'm talking about. Has there been an explanation or resolution to the slipcases issue? I would like to order a copy but not if it’s going to be defective. >27 jroger1: I'm waiting for a new one, it's processing. They went through most of them and they are unfortunately the same, more or less. I asked them to choose the less faded one for me. Keeping my fingers crossed. Dr. Jekyll and Mr. Fade! does the cover make cool sounds?